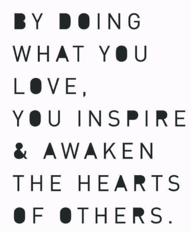 This intrinsic drive to do work that I'm passionate about, coupled with an awareness that the impact of my work creates real value for others is what keeps me going when things get hard. Eleven years of growing a business and a team, creating a value proposition that resonates and then relying on others to deliver on all of those promises takes a toll on any leader. Having awareness around my own Unique Ability, and intentionally acknowledging the impact that the work that I do has on my team and our clients is what keeps me going personally. Understanding this uniqueness in yourself is the key to finding work you love that you're excited about even when the days get hard.